Here is a simple Portable Power Bank that finds many uses. It can be used as a Portable Mobile Charger or it can be used for powering the bread board projects and so many applications that requires 5V Regulated DC. Let us make it. 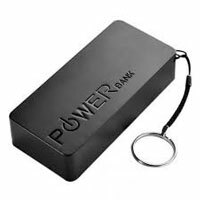 The input power for the Power Bank is a 9V Volt Rechargeable battery. This can be charged externally using a 12 volt power supply. Green LED indicates the charging of 9V Battery. Diode D1 prevents the backward flow of current from the battery to the power supply. From the battery, 9V passes through the Voltage regulator LM 7806. It then gives 5.3 V regulated power for charging the Mobile battery. Another output can be used to tap 5V DC for the bread board projects. The Mobile charger section has components like D2, Red LED and R2. Diode D2 forward biases to give power to the Mobile battery. Mobile battery is rated 3.6 V, so the 5V DC very well charge the battery. The Red LED gives good indications about the charging process. It lights and confirms when the Mobile battery is connected to the socket. That means, first indicates whether the Mobile battery is connected properly or not then indicates the charging process. At first, the LED glows in full brightness. When the charging completes, Red LED turns off indicating full charge. Resistor R2 is the current limiting resistor for charging. .